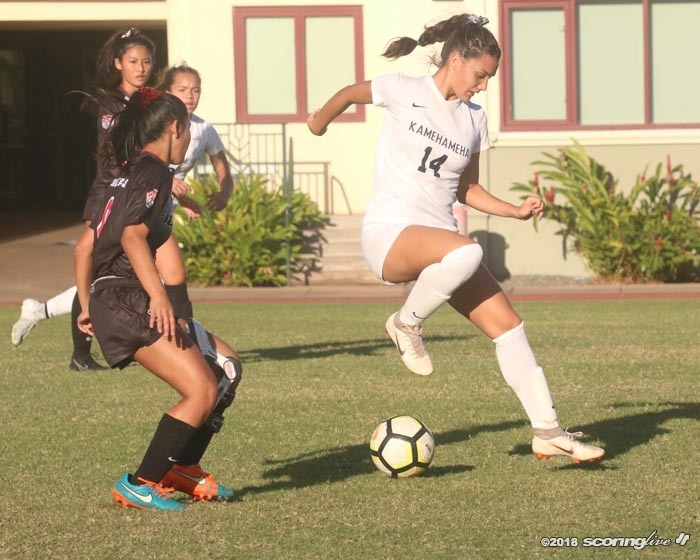 ALA WAI — Caili Cain came off the bench to score the lone goal in Kamehameha's 1-0 road win over defending Division I state champion Iolani to open the Interscholastic League of Honolulu season Wednesday. 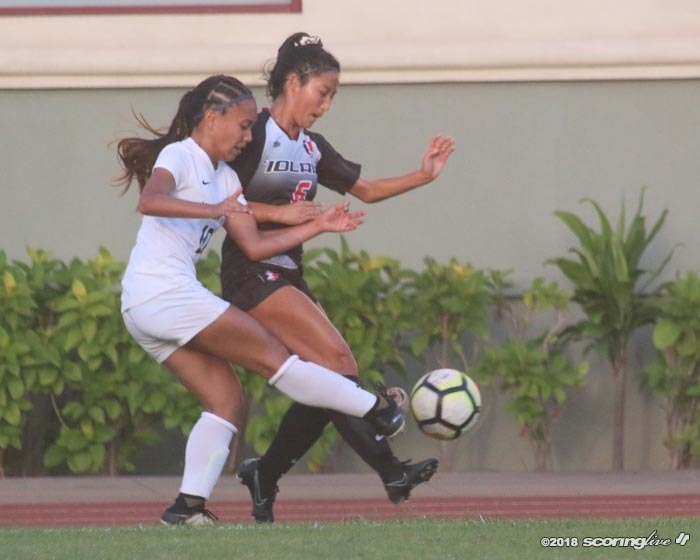 An afternoon crowd of about 200 fans at windy Kozuki Stadium saw the Warriors (1-0) turn the tide after halftime after the Raiders (0-1) largely controlled the first-half possession. 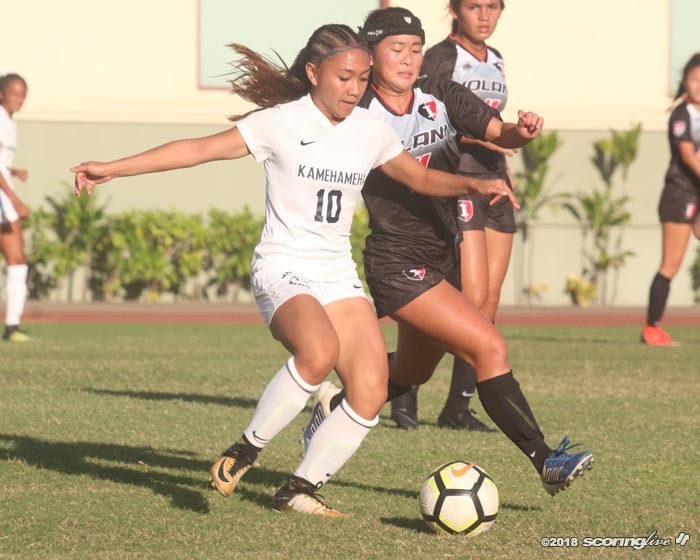 Cain, a junior forward, scored in the 69th minute on a restart after there was a pause in the action due to a cramp to Kamehameha's Kalia Kalua. 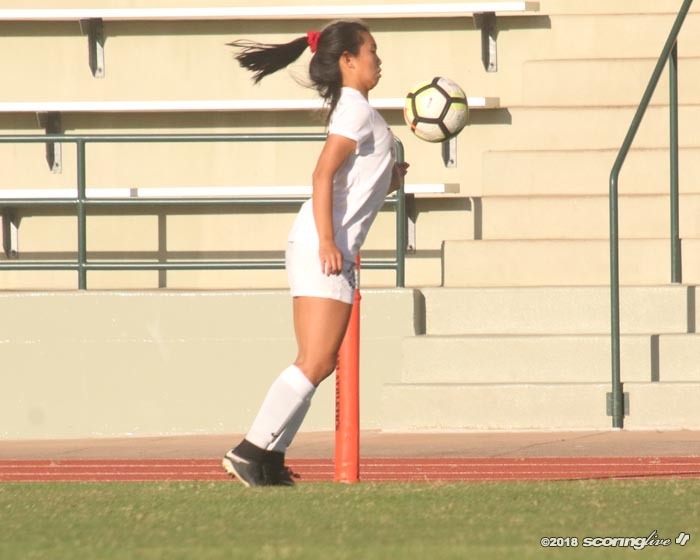 Caly Ahsoon served the ball toward the right side of the 18-yard box to Cain, who headed it to her teammate, D'awncey Jones. 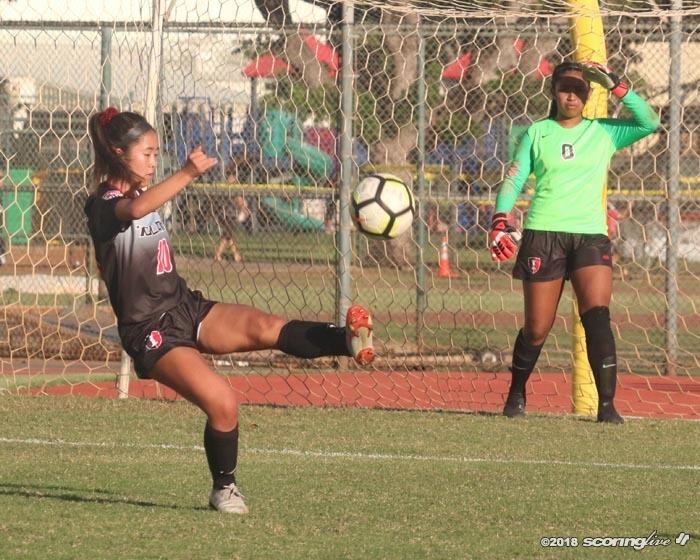 Jones passed the ball back to Cain, who put away a right-footed shot over Iolani goalkeeper Musuai Isaia. 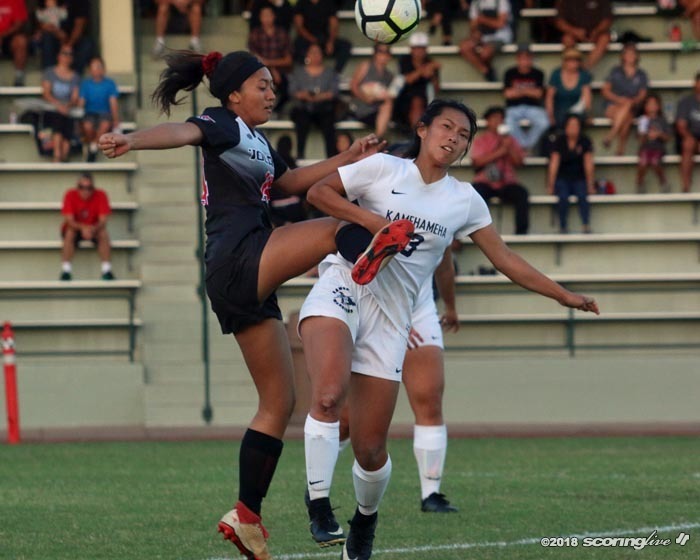 "I think I had just come in, so I was ready to just play and just play as hard as I can for my team because time is running out and there was a free kick, it went over, I hit it with my head to Kitty, she passed it, like a little flick back and then I just one-touched it in," Cain said. 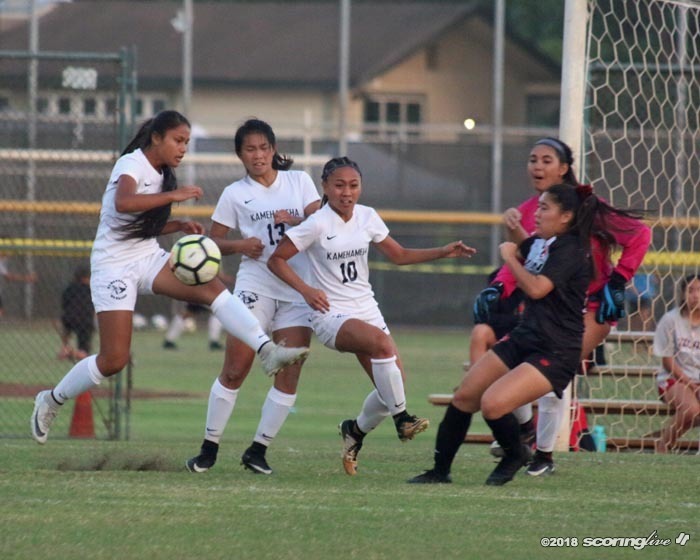 Warriors coach Melissa Moore described the play as she saw it from the sideline. 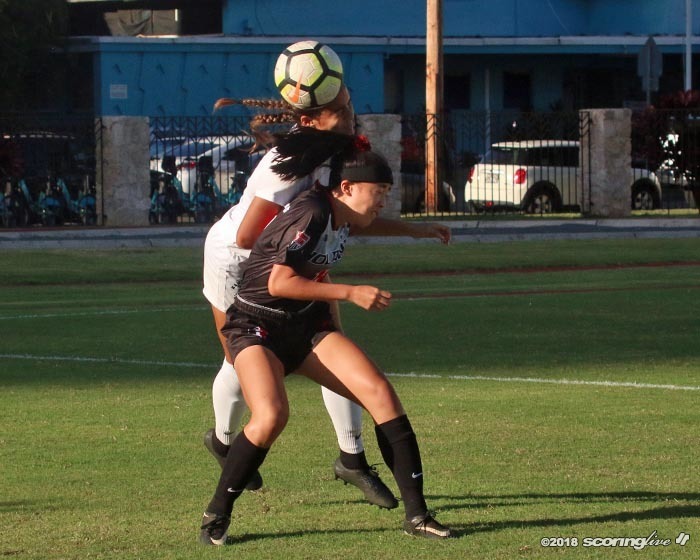 "I saw like a deflection and a volley, that's what I saw, but it was perfectly placed and a very nice finish, very composed," Moore said. 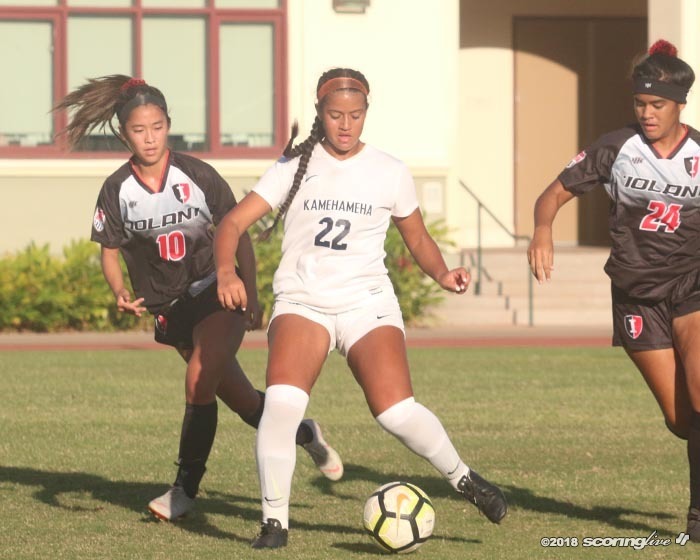 FINAL: Kamehameha 1, Iolani 0. 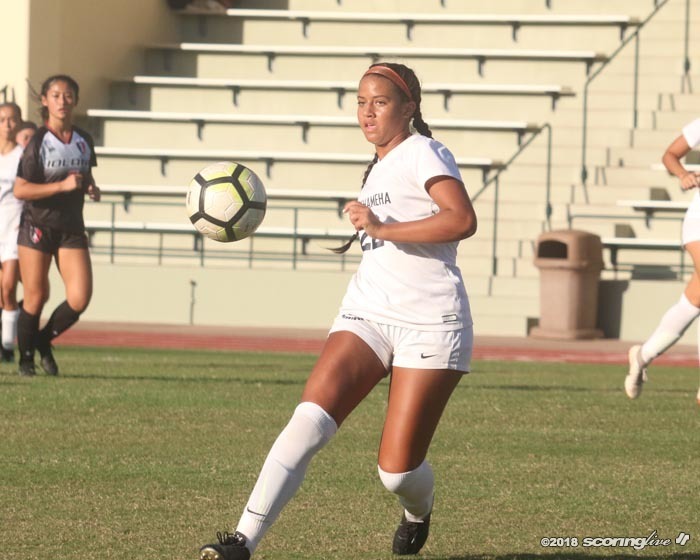 Caili Cain's goal in the 69th minute was the difference in the league opener for both teams. 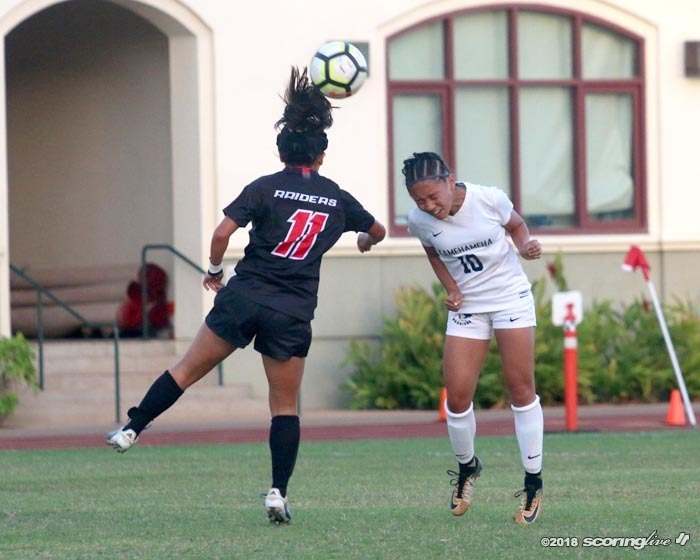 Warriors (1-0) played w/o standouts F Leah Feato & D Tausani Tavale. 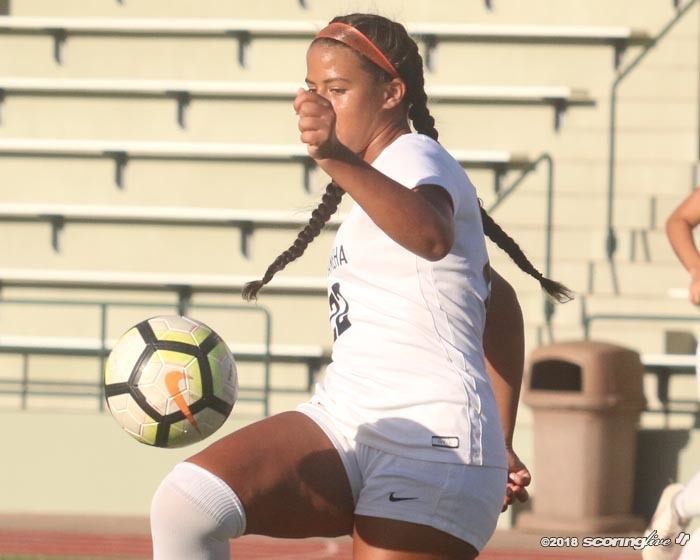 Raiders (0-1) played w/o MF Sierra Wheeler & F Sasha Asselbaye. 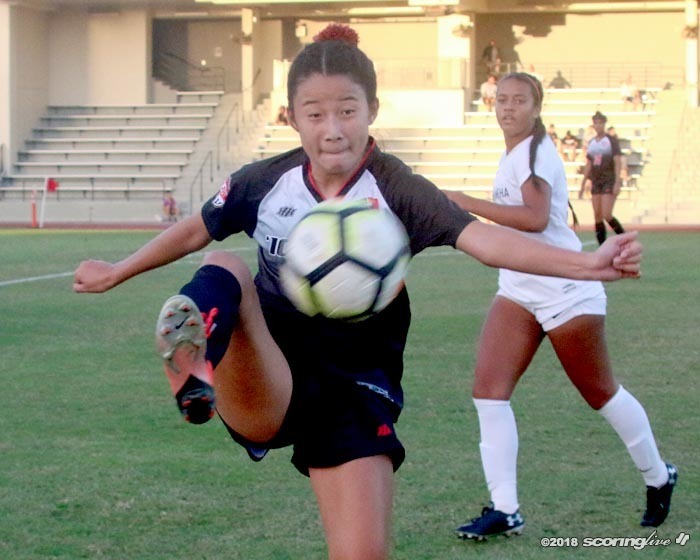 The teams played to a scoreless first half, but Iolani registered nine shots by the intermission — seven of them on goal. 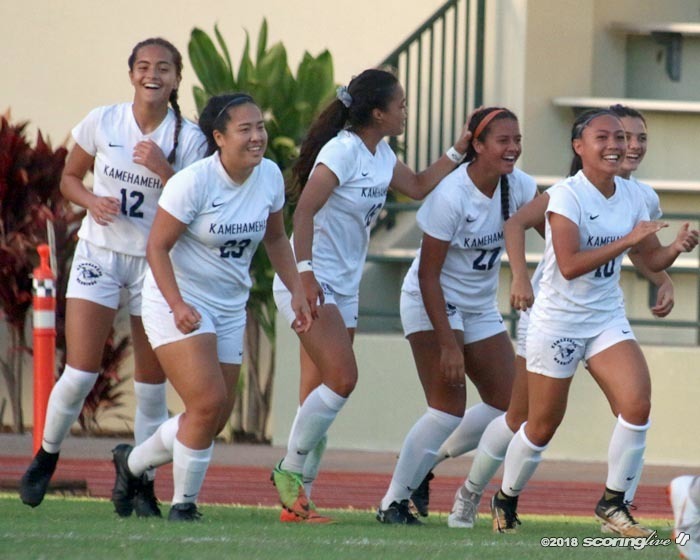 In contrast, Kamehameha had just two shots on goal, five in all, in the first 40 minutes. 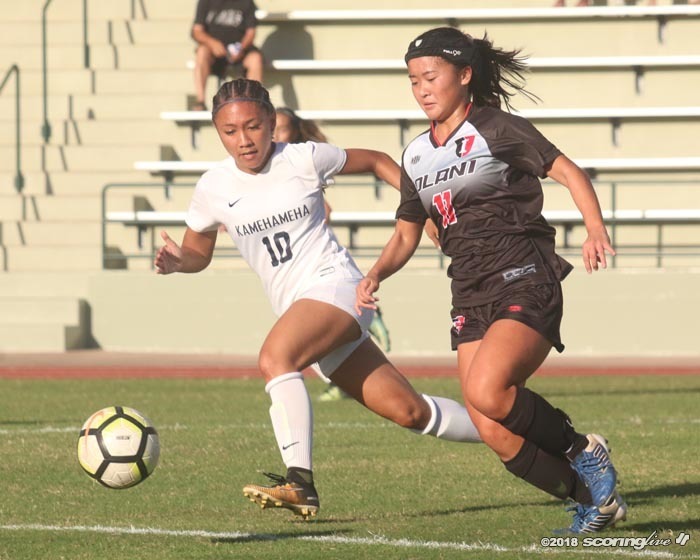 "I think we realized that we were better than how we played in the first half, so we had to come out a lot stronger and a lot bigger, a lot faster than the other team because we had to want it more to win," Cain said of her team's halftime adjustments. 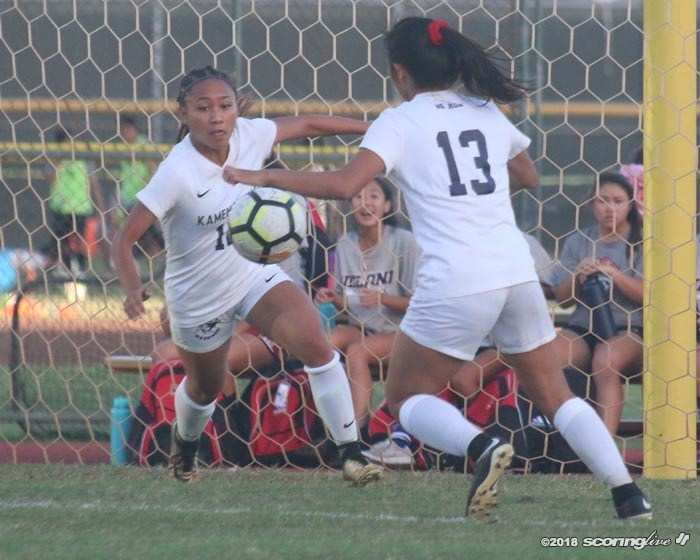 Moore agreed with Cain that it was more a matter of will than any tactical adjustments made at halftime that got things going. 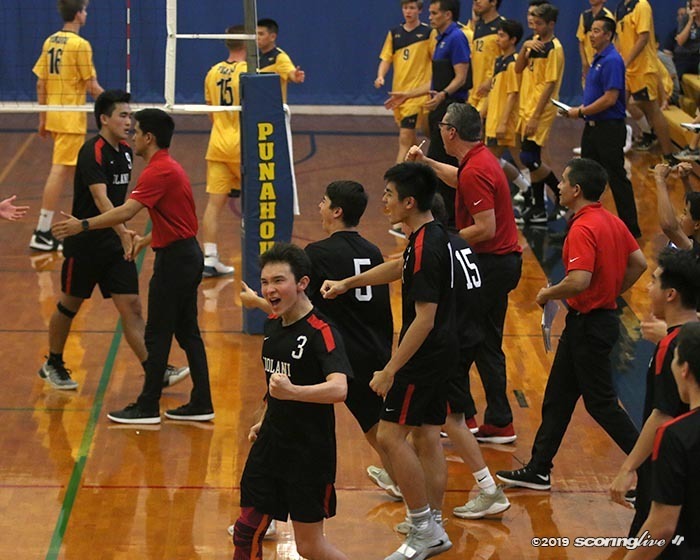 "Just wanting that grit and effort out of them, you know, ‘win the 50-50 balls first and foremost and move, move off the ball, don't stand and wait for your teammate to do something, you gotta move,' so a few adjustments there, they did a little bit better, but really it wasn't a quality game for us, to be honest with you, Moore said. 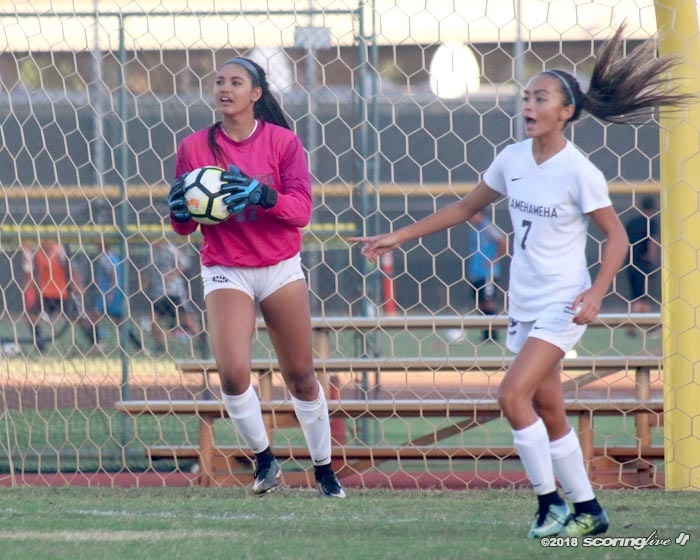 About six minutes after Cain's goal, Warriors goalkeeper Caela Kaio preserved her team's lead with a pivotal save. 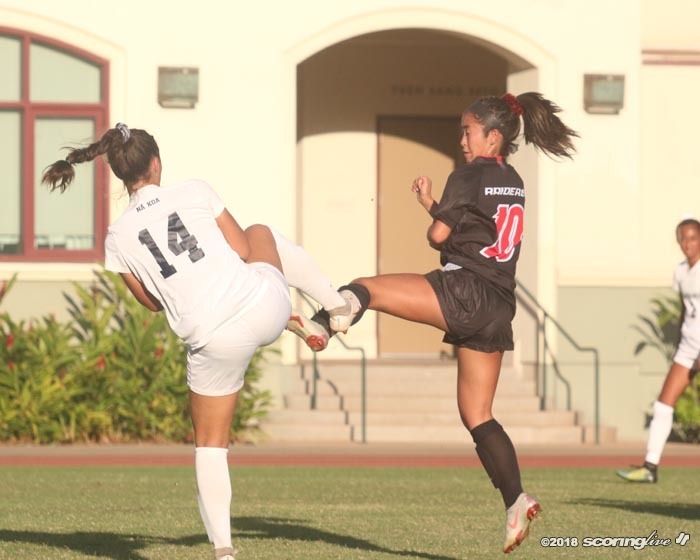 A foul by Kamehameha allowed Kelsey Wong to attempt an indirect free kick from about 40 yards out. 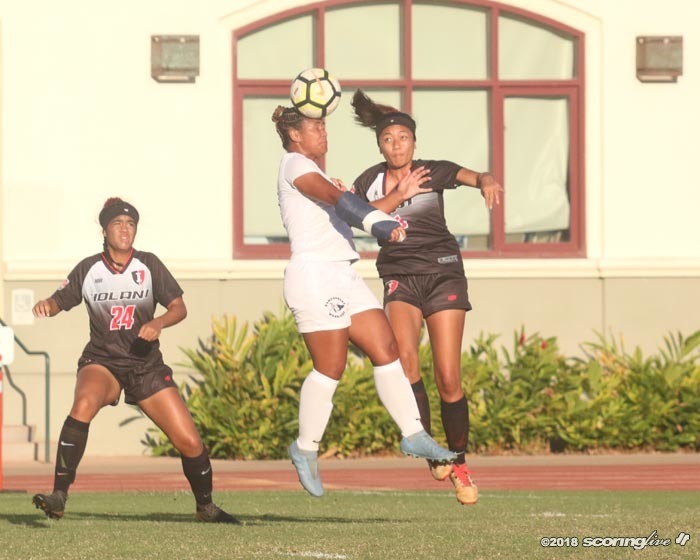 Wong blasted a line drive that was headed for the top left corner of the goal — in the area of a charging teammate — but Kaio was able to make the save to end the scoring threat. 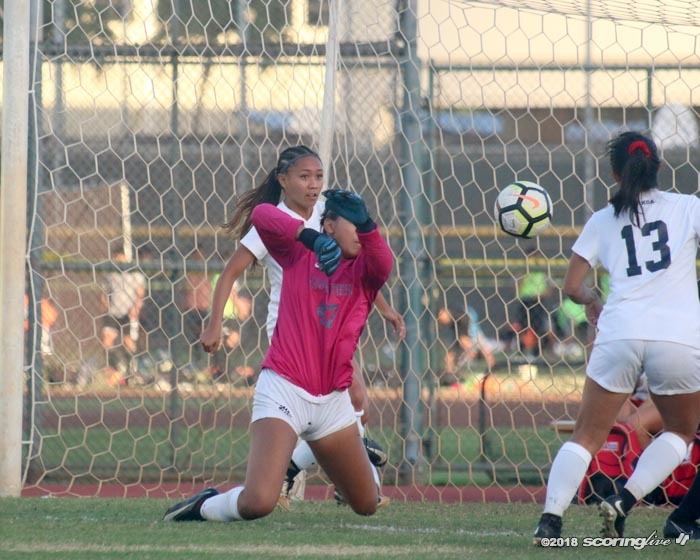 Second half Kamehameha keeper Caela Kaio comes up with a critical save late in the match. 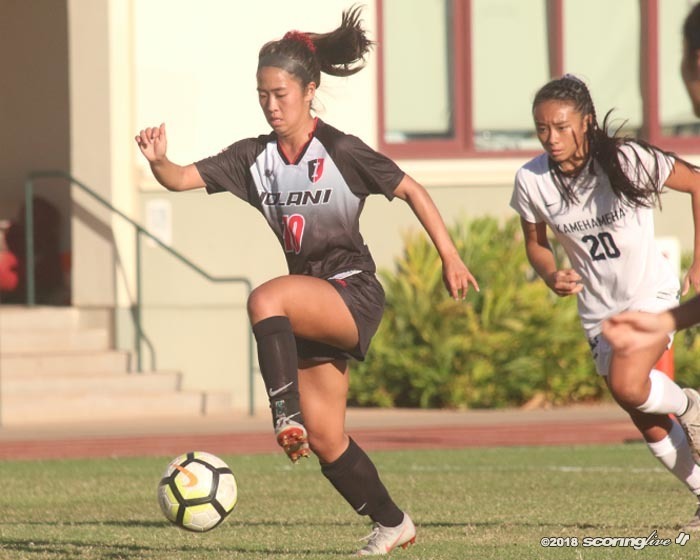 "I've seen number 21, Kelsey Wong, I think, hit those before and I pretty much knew that she can hit it, she has the range and she can definitely get one off, so I knew to stay more back towards my line because just reading the play, I didn't think I'd be coming out," said Kaio, a 6-foot senior. 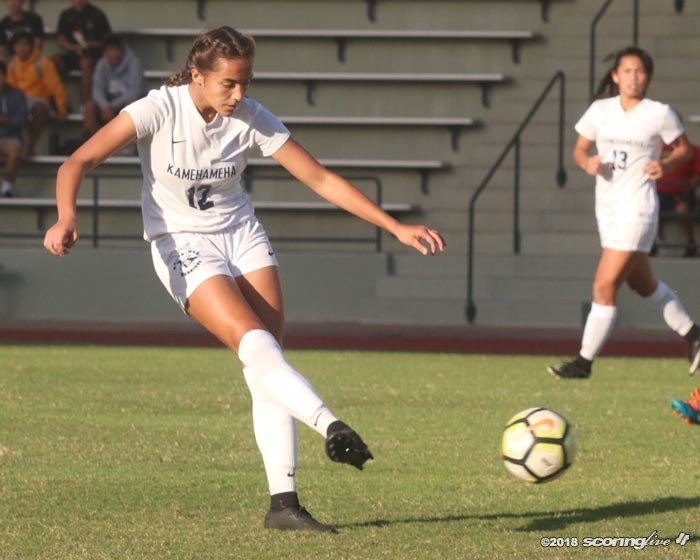 "I didn't think it would be a short ball, I knew she would go for the goal because that's what they needed so I stayed back on my line and it was pretty far out, so I had a lot of time to read it and I just went to it." 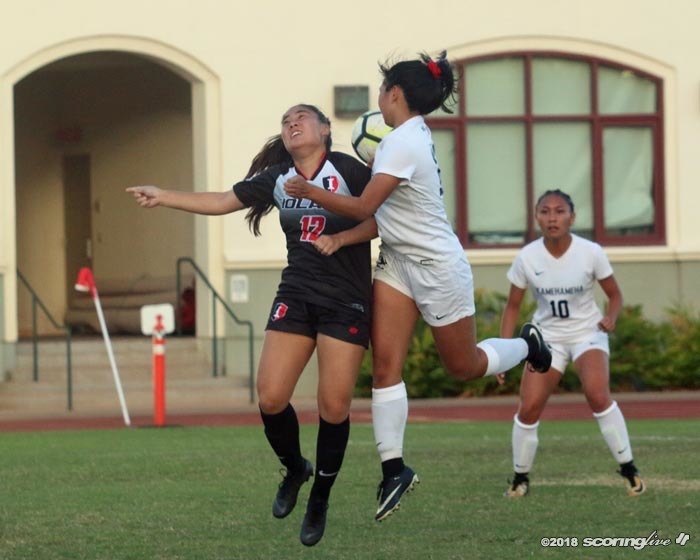 Kaio said she did not see the oncoming Iolani player from the wing, but noticed her in her peripheral as Wong's shot came from distance. 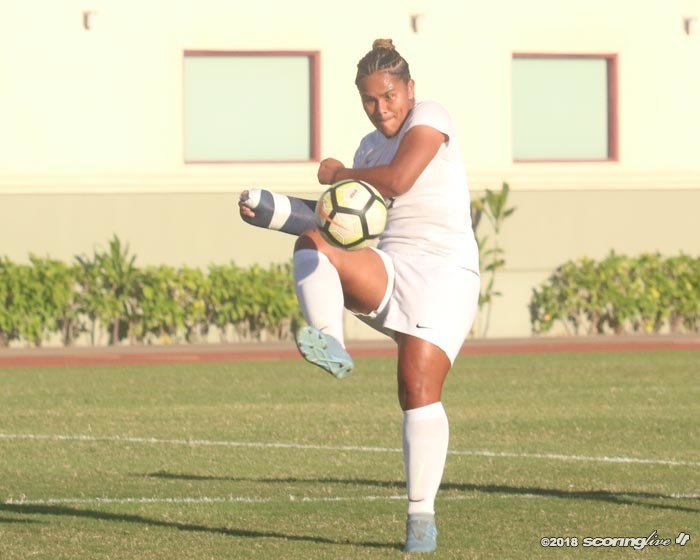 "I didn't see her at first, but when I saw her, I realized that I wasn't gonna be able to get to the ball, I wasn't gonna be able to hold it, so I tipped it over her — because I definitely have height as advantage over most of the forwards — so I tipped it over her and then cleared it, picked it up and punted it out," said Kaio, who played the entire second half and made five saves in goal. 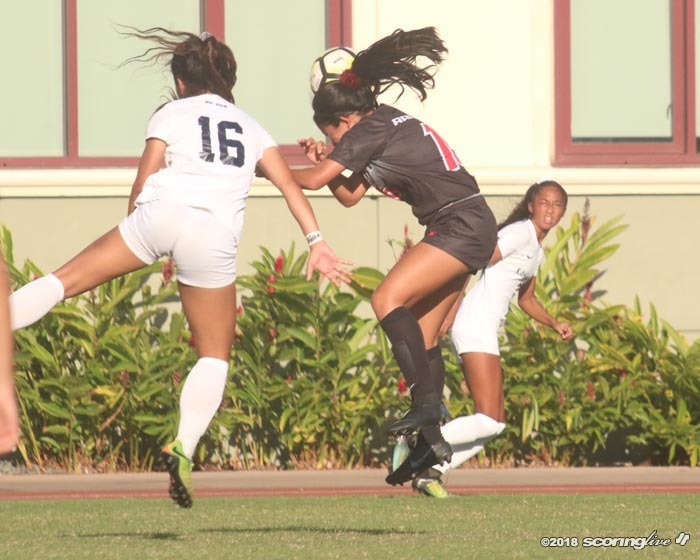 She relieved starter Chaylea Tome, who made seven stops in the first half. 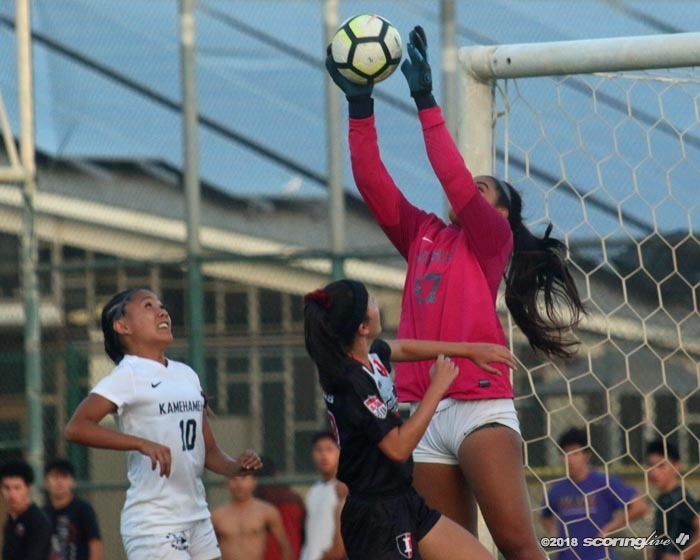 The Warriors used a similar plan in goal last year when then-senior Kendal Stoval typically handled one half of the keeper duties and Tome the other. 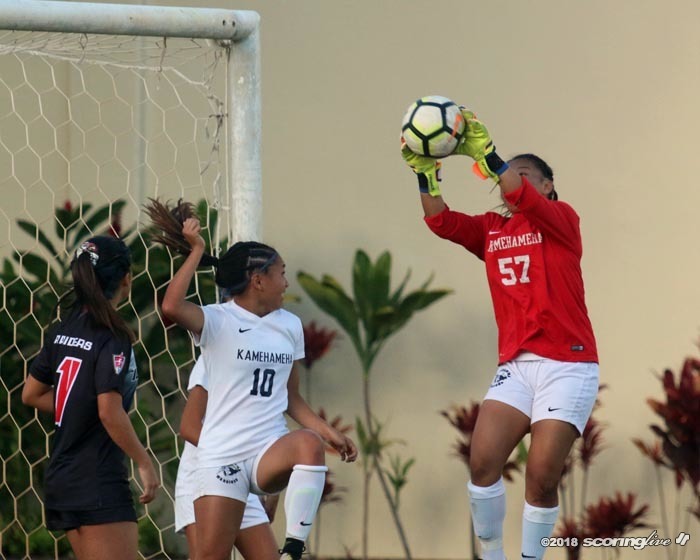 "I think that the way we play, our style, how we switch out the keepers at half, I think, definitely gives us an advantage because it's like fresh feet with a keeper is coming in and she's not tired at all, she just warmed up at halftime and she's ready to go," Kaio said. 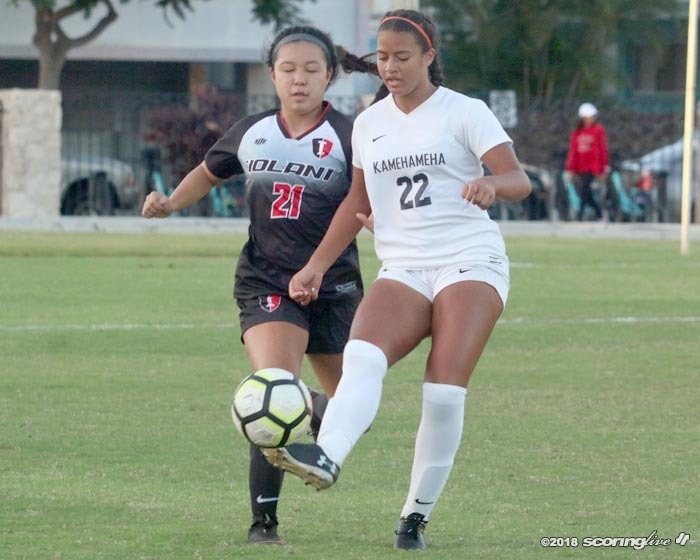 Kamehameha had nine shots, five on goal, for the game, while Iolani took 12 shots on goal and 18 in all. 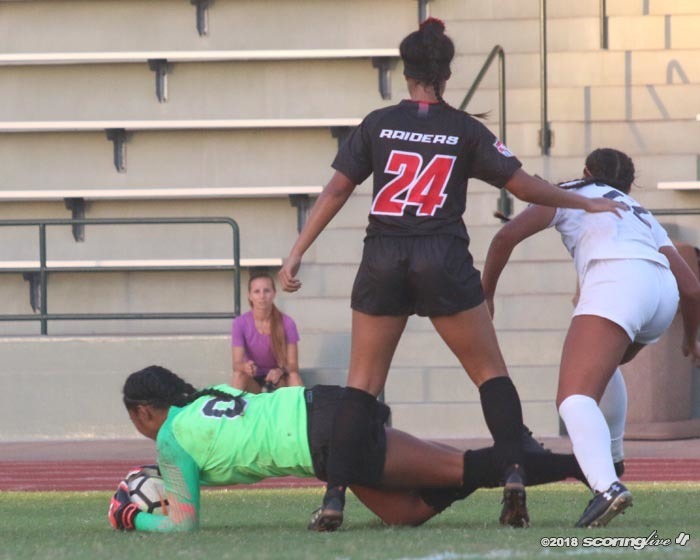 Isaia made four saves in goal for the Raiders, who were unable to cash in on four corner-kick opportunities — all of them in the first half. 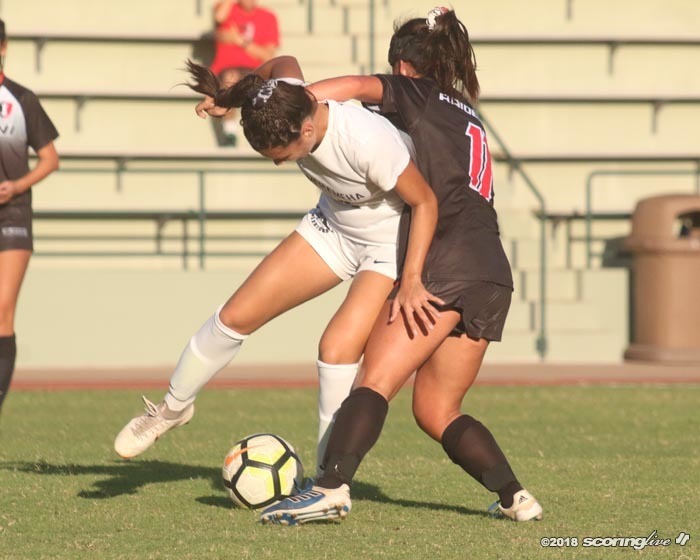 Moore said that while the win was nice, it left to be desired from her young squad. 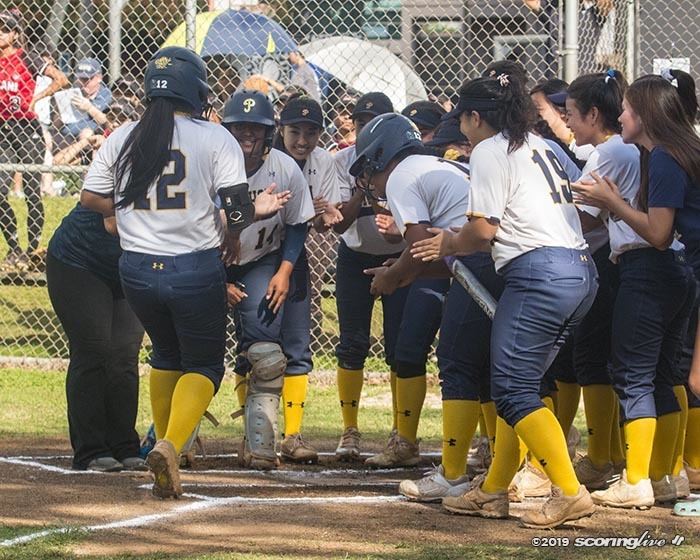 "To be honest with you, today was very eye opening for us. 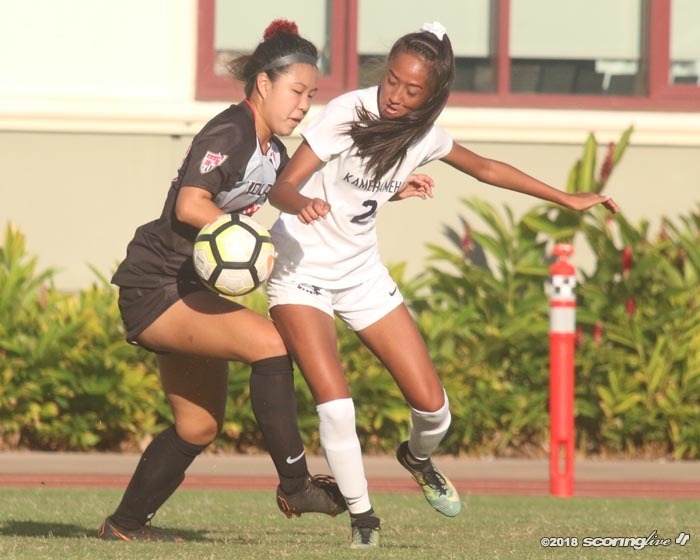 We have a lot of work to do," Moore said. 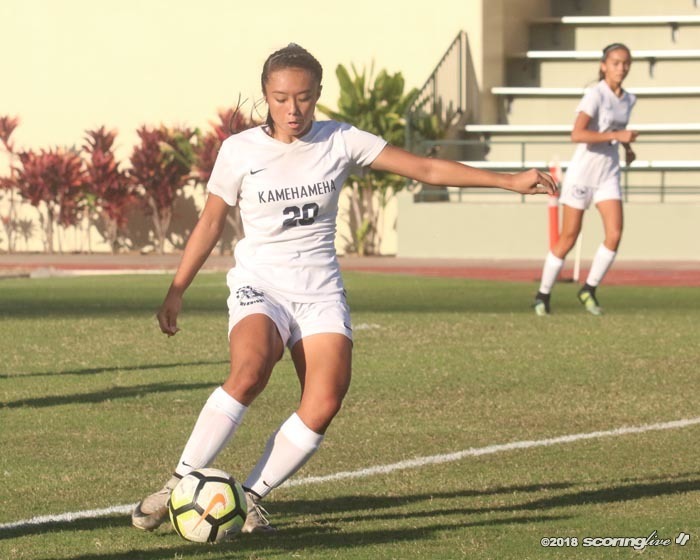 "I mean, any time you can win in the ILH is huge — I'll take it — don't get me wrong, but we have a lot of work to do." 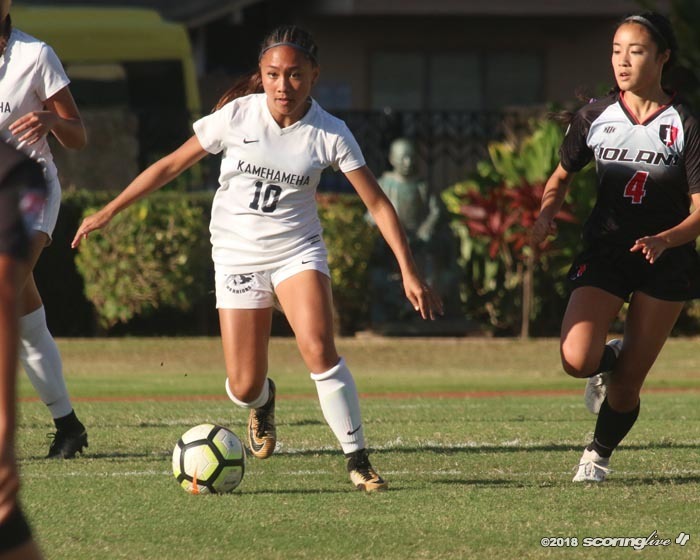 Both teams played without key returnees who are still recovering from injuries. 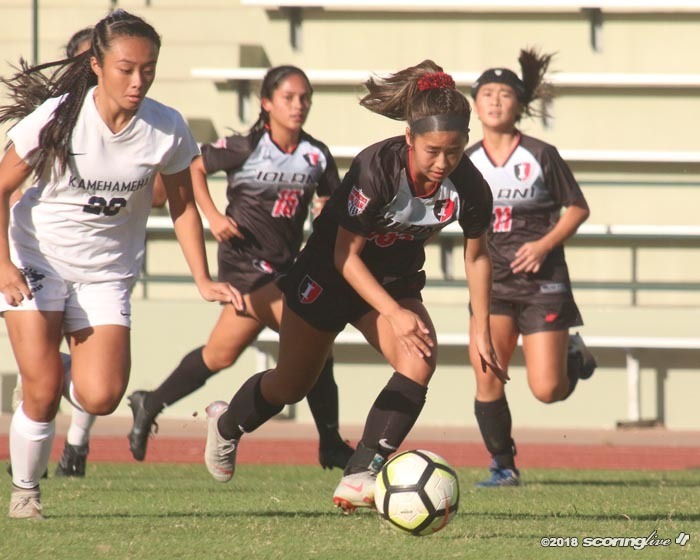 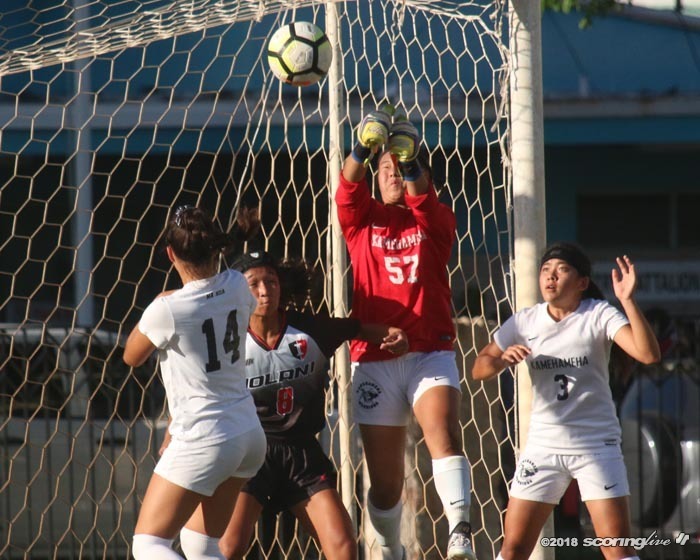 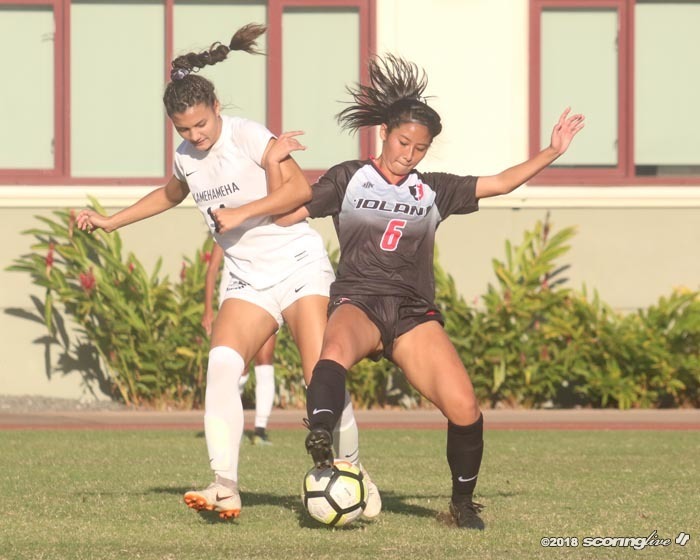 Iolani was without forward Sasha Asselbaye and midfielder Sierra Wheeler, while forward Leah Feato and defender Tausani Tavale was out for Kamehameha. 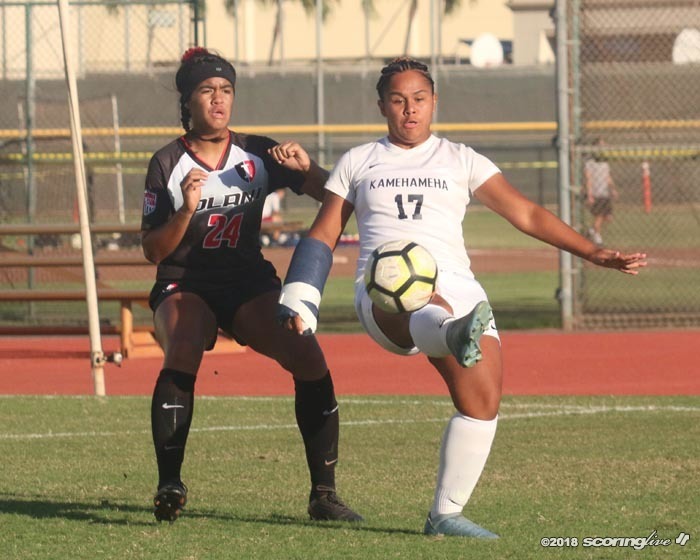 Wheeler and Tavale were first team All-Hawaii selections last season. 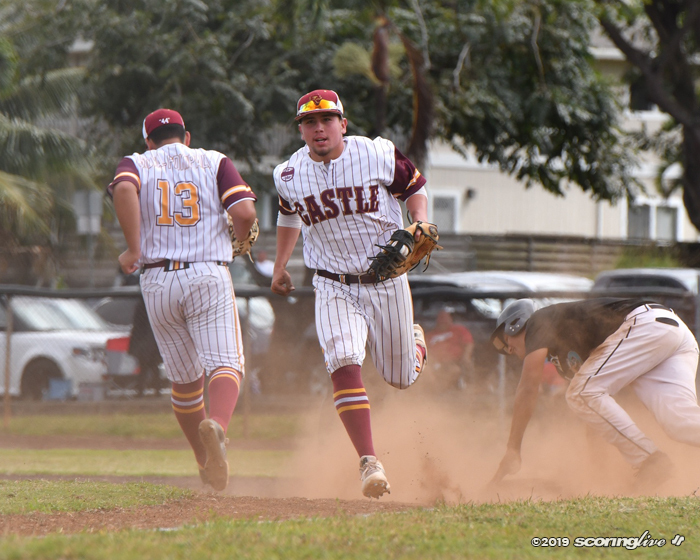 "We have a lot of injured players that are key role players on our team, but we're making do with what we've got," Cain said. 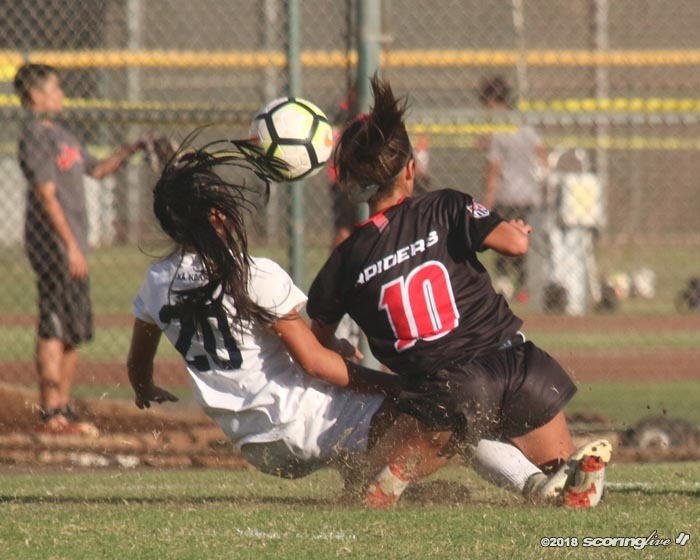 "We have a great team, so I think we'll be fine." 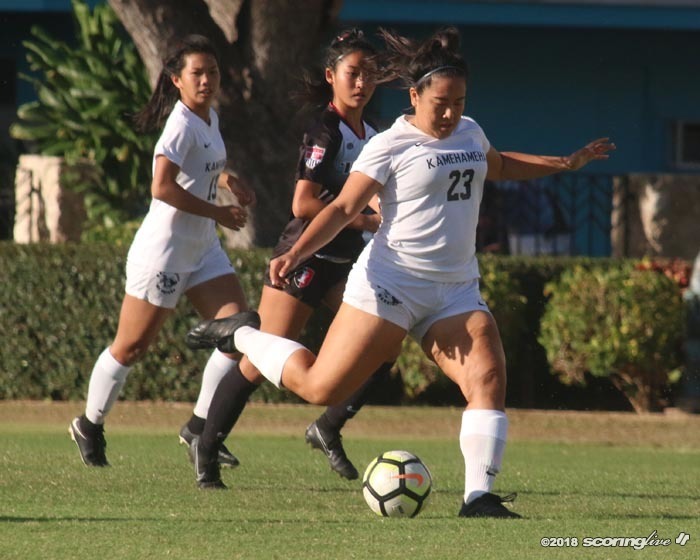 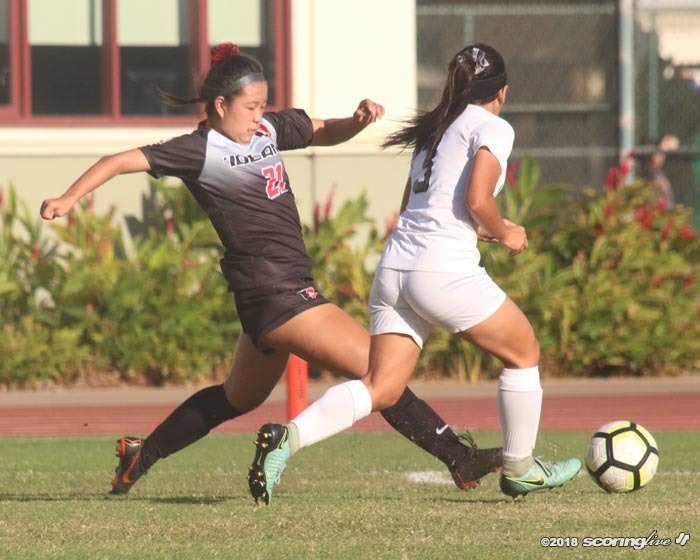 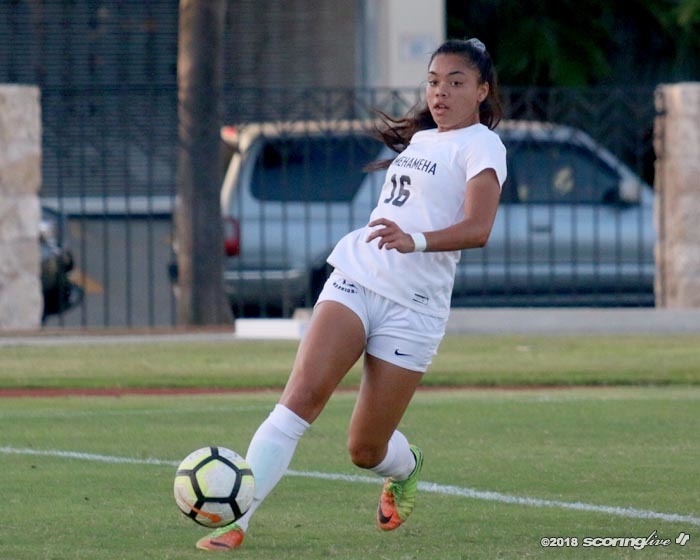 The Raiders will also have to overcome the loss of midfielder/forward Mia Watanabe, who earned All-Hawaii honors in both her freshman and sophomore seasons, but opted not to play high school soccer this year. 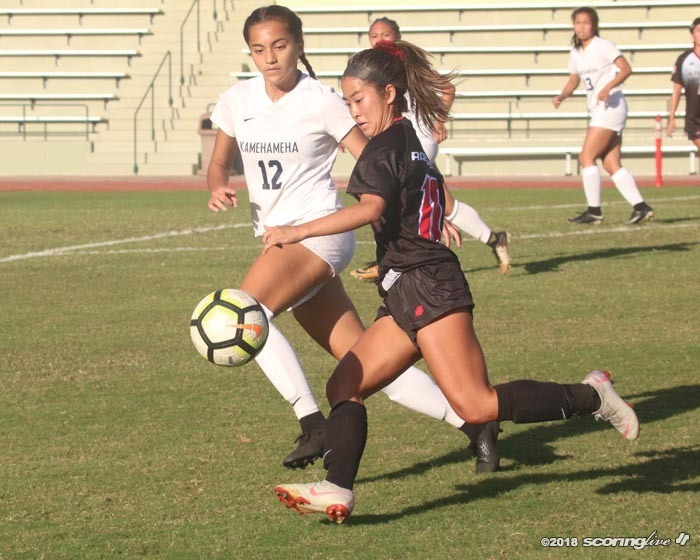 Iolani beat Kamehameha in the preseason in a game decided by penalty kicks. 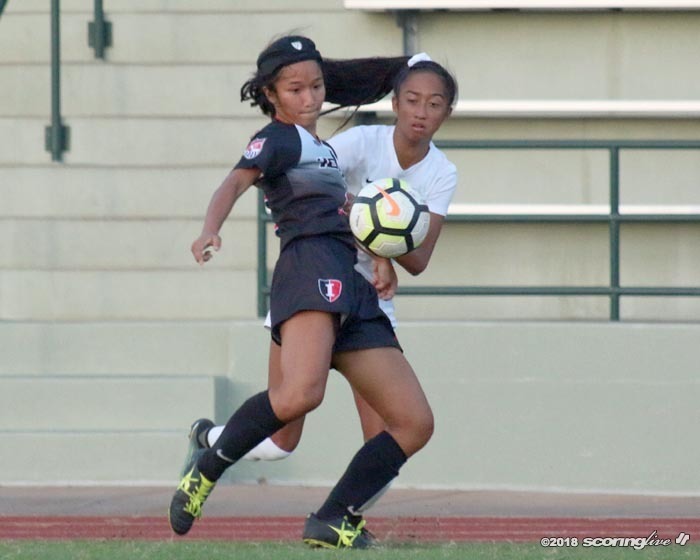 The teams will play again at Kunuiakea Stadium on Jan. 4. 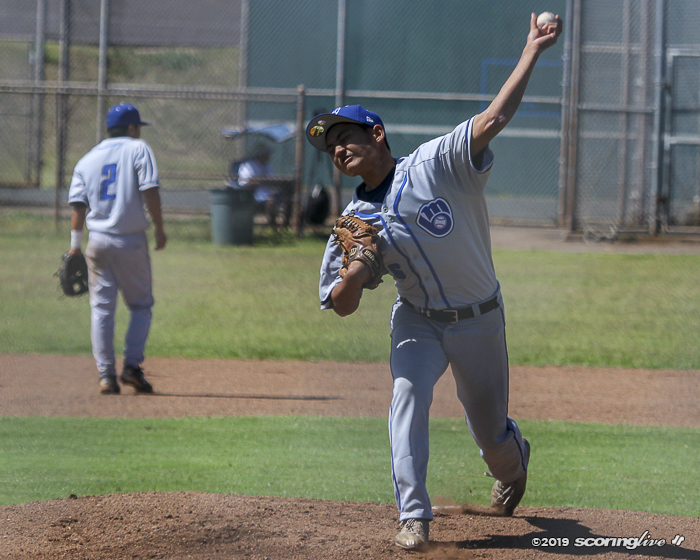 The Knights led 4-1 after the second inning in their first round playoff victory. 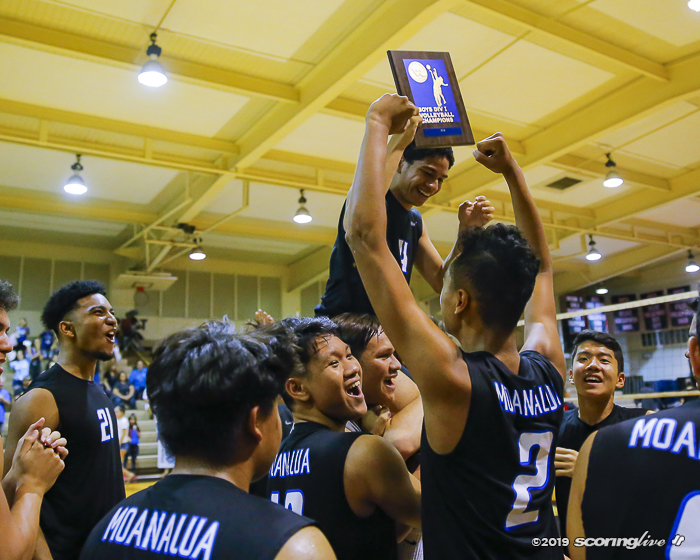 Moanalua successfully defended its OIA Division I title with a four-set win over Kalaheo. 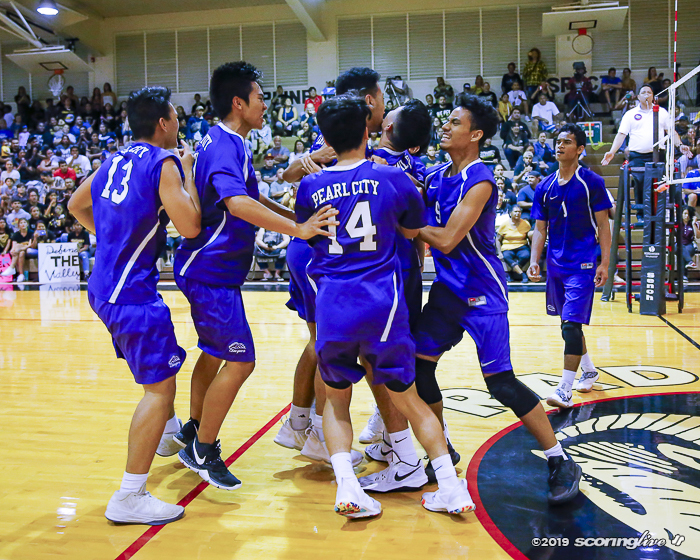 The Chargers clip the Golden Hawks to win back-to-back OIA Division II titles. 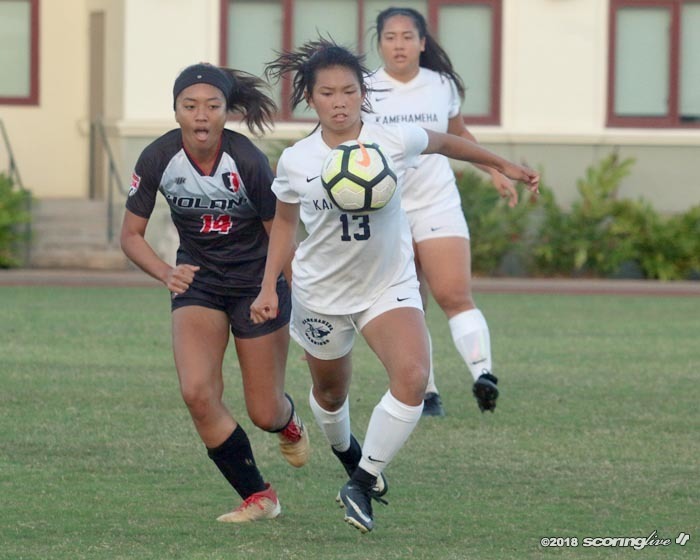 Na Menehune eliminates Na Alii to advance to Thursday's OIA quarterfinals round.